I didn't think so. Let me introduce you to a friend and fantastic seamstress Lucia Clark, with L.C. Designs located in Steele Creel area. I have known Lucia for several years now and knew about her skills and talents as a seamstress from remembering outfits she had designed and sewed for kids in our Mom's group. However I quickly learned her true joy for her business when I walked into her house one day last week. Needless to say, I just love when I see someone take a Living room or Dining Room or any room for that matter and turn it into their "Passion Room." It tells me that you are doing what you love, even if it takes over a room in your house. And rightfully so. Lucia studied Fashion Design at Centinary College in New Jersey, and has been surrounded by creativity and sewing her whole life (her Mom a seamstress, her brother an artist). Lucia has turned her own talents into a unique business offering - a variety of creations for just about anyone. And much more... L.C. Designs also offers alterations and Lucia is happy to sew together outfits that her customers design. Most recently she sewed an outfit for an entire family for a Disney trip. Local mom, Amber Greenwalt provided the design and fabric choices, and Lucia, armed with her sewing machine, brought Ambers concept for the outfits to life. 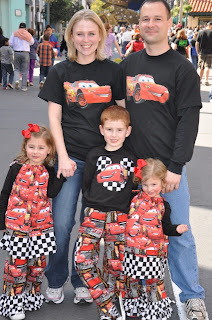 The Greenwalt kids in Orlando wearing their stylish Disney outfits. "I am a very visual person" Lucia tells me. She flips through idea books constantly, tucking away ideas and certain designs for future projects. She can sketch just about anything and is happy to consult with her customers on design plans for any room in the house, kids outfits, bedding and more. She also offers teaching for those of you who would like to learn more about sewing and design. In a nut shell, you will appreciate Lucia's talent and her skilled work, and enjoy the professional technique and expertise she brings to custom design projects that fit your life. She has years of experience with an elegant eye for style and creativity, whether it's something for your family or just for you. Joe also helps out on projects that require some carpentry work. Having a handy husband helps Lucia when she designs a project for a room. Designs can also be transported not just to fabric but also wood. Lucia holds up two wood frames that eventually will go over a baby's crib. For more information on L.C. Designs and if you would like to discuss a design project with Lucia you can reach her by e-mail at lucia1230@msn.com or by phone at (704) 441-3276. You can also see some of L.C. Designs products at the upcoming Spring Fling held in Baxter Village on Saturday, March 19th. One of Lucia's custom handbags. A sample of fabric designs to switch out for hand bags. More of L.C. Designs on display at a recent holiday "Sip and Shop" event in Berewick..